My daughter runs. She competes at the 1600 and the 800 so she trains by running 6 or 7 miles most days, timing herself as she goes, making sure she maintains a coach-determined pace. 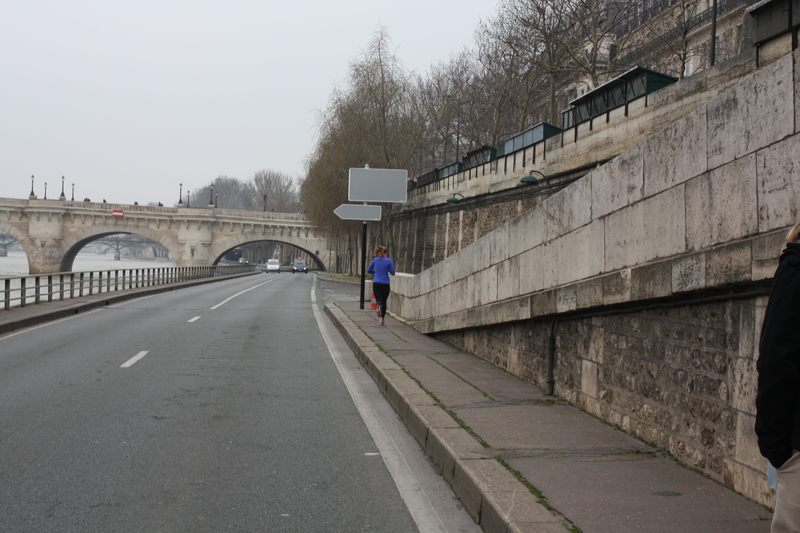 We visited France over Easter and she ran—along The Seine, across cobblestones, weaving through crowds. In the snow and rain, early in the morning or late at night, even loaded with homework and volunteer obligations—she runs. Her hope is to PR—to set a personal record—which means shaving a second or two off a number she gave everything to achieve in her previous meet. Running is about having the guts to work against something that has no compassion. Running is about believing in your ability to improve, even incrementally, and despite setbacks and adversity. Running is about the strength to do what hurts. It is about the pride to not get overtaken. It is about harvesting determination on a cellular level. My son is a student at Boston College where a friend—a runner—lost her leg in the bombing. This friend was on a full scholarship, and participating in the marathon. What happened to this young woman–to all of the victims–neither makes me sympathetic to terrorist ideals nor ready to condemn any political stances. This young woman makes me want to get in my car, drive to Boston, and help—with anything. I would give nearly anything to have been there yesterday. Instead, and for Boston, I won’t get in my car.